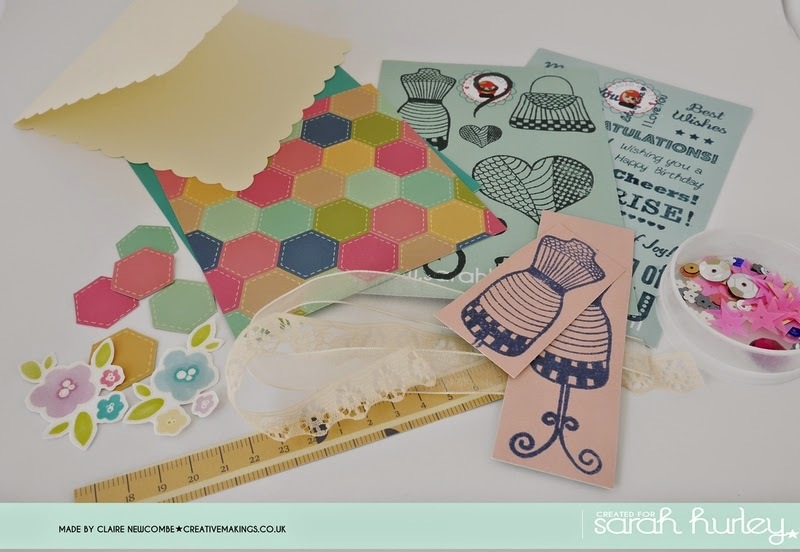 Sarah Hurley 365 (Formerly Sarah Hurley Challenges): Crafting on a Budget - Sew, it's Mother's Day soon! Crafting on a Budget - Sew, it's Mother's Day soon! To continue my little series, Crafting on Budget, I have created a little card perfect for Mothers Day, that is coming up for us very soon here in the UK. As in previous posts (the links are here and here), I have used all supplies i have recommended, and also as previously promised I have included a new set of stamps, Sarah's Zendoodle Fashion Stamps. Here you can see the materials I have used, again it is a great way to use up the small scraps that may be left on your desk, along with any lengths of ribbon/lace/sequins etc., and its great to get so much dimension and texture on a card. Because this is a sewing themed card, it would also be great to use buttons to accent the card too. The strip of tape measure I have used here is cut from some of Sarah Hurley's design papers, but how about this for an idea....how about using a real tape measure, the little mini ones you get from Christmas crackers (and hang about for ages...in our house anyway!) are absolutely ideal, and add to the authenticity of the theme. We would love to hear if you are finding these themed posts useful....perhaps you have some papers or embellishments for an absolute age and you can't figure out how to use them? Drop us a note and we'll see if we can help you. In the mean time, head on over to Nicole's post (link here) from the other day. Nicole is a whizz at coming up with fabulous and inventive ways to use up those odds and ends that are laying about.....I love reading about what she does. That's fabulous and I totally agree about the cracker gifts, they hang around here too until I see potential in one or two!! Love your card it's wonderful. great card Claire and perfect for all the sewing bee's out there!